Genital Autonomy America (GA America) is an amazing organization which has helped thousands to attain, and continues the fight for all babies and children to attain the right to genital autonomy. 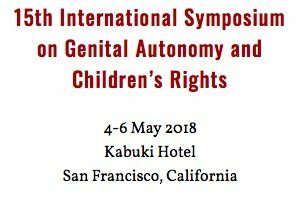 I’m honored tobe presenting the keynote address at their 2018 Symposium this year in San Francisco! Saturday, May 5th. 0900 – 0925. ← Presenting Keynote at Texas State University’s Queer Summit!